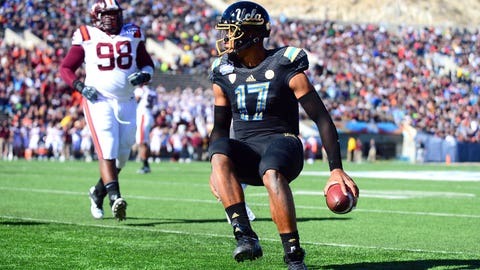 Brett Hundley threw two touchdown passes and ran for two more scores in Tuesday's Sun Bowl win. Brett Hundley shredded Virginia Tech’s fourth-ranked defense in the Sun Bowl. The UCLA quarterback had 86- and 7-yard touchdown runs and finished with 161 yards on 10 carries in the No. 17 Bruins’ 42-12 victory over the Hokies on Tuesday. "I guess he can run a little," UCLA coach Jim Mora said. "He played well. He was poised." Hundley also completed 16 of 29 passes for 226 yards and two scores. "It was a special game," Hundley said. "We played well as an offense. We had to make adjustments. When we did, we got things going." Hundley and UCLA linebacker Jordan Zumwalt shared MVP honors. Zumwalt had 10 tackles and returned an interception 43 yards to set up a touchdown. "It’s the best game I’ve ever seen him play," Mora said about Zumwalt. "He was unbelievable from start to finish. The Bruins (10-3) outscored the Hokies (8-5) 28-2 in the fourth quarter. After Virginia Tech cut it to 14-10 on Michael Branthover’s 22-yard field goal with 3:53 left in the third quarter, UCLA answered with a 12-play, 85-yard drive, capped by Paul Perkins’s 5-yard run early in the fourth. "In the second half we blocked things up better," Mora said. "We got back to doing what we do best. We played with great tempo. We were not as uptight." Virginia Tech, which lost starting quarterback Logan Thomas to an injury in the second quarter, got its final points when UCLA punter Sean Covington stepped on the end line for a safety with 9:38 left. Thomas, Virginia Tech’s career passing leader, left after taking a big hit along the UCLA sideline early in the second quarter. The hit resulted in a 15-yard penalty on the Bruins. "It was tough to miss time on the field, the worst feeling of my career," Thomas said. "I would have rather you guys talk bad about me than miss time on the field. We were doing some good things on offense. I thought we were right on the verge of doing some good things." UCLA pushed it to 35-12 on Hundley’s 8-yard touchdown pass to Thomas Duarte with 7:31 to play. The Bruins stayed aggressive late, and Hundley fired a 59-yard scoring strike down the right sideline to Shaquelle Evans for another score with 5:49 remaining. It wasn’t that easy early on, though, for UCLA, which led 14-7 at the half. Hundley had six carries for 168 yards in the half. He set the Sun Bowl record for rushing yards by a quarterback by halftime, even though he lost 7 yards in the second to finish at 161. The Bruins rushed for 202 yards in the first half, and finished with 197. The win in the first meeting between the teams allowed UCLA to post its first 10-win season since 2005, and helped the Bruins forget last season’s 49-26 loss to Baylor in the Holiday Bowl. Virginia Tech had its second-worst loss in a bowl game. Its worst was a 42-3 loss to North Carolina in the 1998 Gator Bowl. The 42 points the Hokies allowed were the second-most in a bowl game behind the 52 they gave up in a 52-49 loss to California in the 2003 Insight Bowl. While the Hokies, making their 21st consecutive bowl appearance, were able to limit UCLA’s running backs to 49 yards, they had no answer for Hundley, who repeatedly gouged them for big gainers on designed quarterback counters. "UCLA made the plays it had to and you have to give them credit," Hokies coach Frank Beamer said. "I was disappointed that we didn’t execute better. "When we recovered the fumble down 14-7, I had hoped we could have punched it in for a touchdown, but we had to settle for three and then UCLA comes back and scores to make it 21-10. That was huge. I thought about going for it on fourth down but we just wanted to get something on the board."